Celia Calderón was born in Mexico City in 1921. She died there in 1969. Between 1942-1944 she studied at the Escuela Nacional de Artes Plasticas. 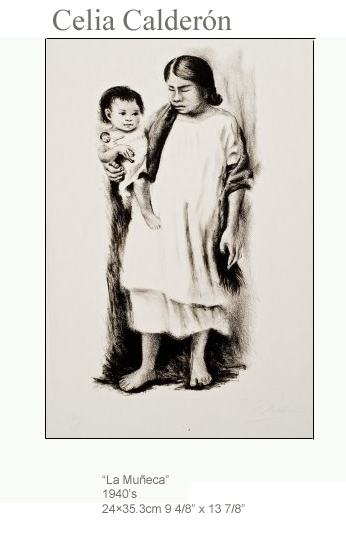 In 1944 she received a scholarship for graduate work in La Escuela de Artes del Libro at UNAM, Mexico City. From 1946 she became a teacher in Art Education. In 1947 she was a founding member of the Mexican Society of Printers. In 1950 she had her first individual exhibit. She was granted a fellowship from the British Council for one year’s studies at the Slade Art School in London. In 1952 she traveled to France and Italy. She joined the Taller de Grafica Popular in 1952. In 1953 and 1959 she was Director of Exhibits at the TGP. In 1957 traveled to USSR and China. In Peking she presented an individual exhibit. In 1963 she was elected President of the TGP. She resigned from the TGP IN 1965. She was also a member of the Salon de la Plastica Mexicana.